Today was the start of another school year for my younger son Miles. For the last two years, as my older son Chase has begun his school year, I’ve written his teachers, therapists, and aids letters – roadmaps if you will – discussing all his “special needs” associated with his Autism diagnosis. This year, today specifically, I feel the need to write a letter to Miles’s teacher – a road map to his personality and struggles. Today was the start to another year. 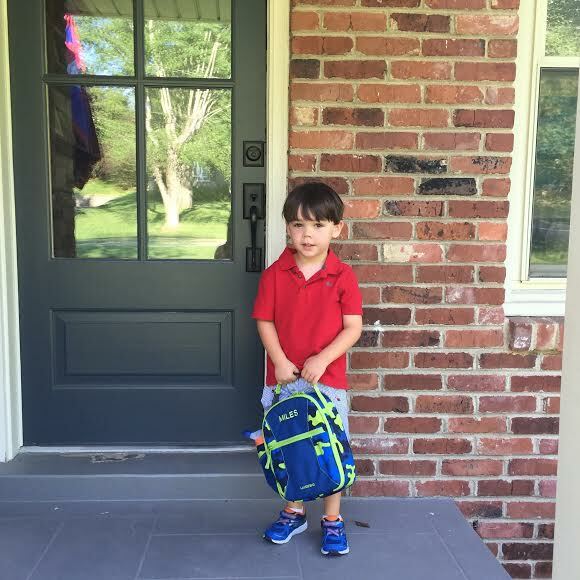 You may have noticed the apprehension and nervousness in Miles’s demeanor when you came for your home visit yesterday, to welcome him to his new class; and even this morning when entering your classroom. While he seems so social and outgoing on the outside, Miles internalizes and worries about so many things. He spent the summer going to super hero and soccer camps, never missing a beat, and always asking/begging to know when it would be time to go back to school. He LOVES school! And he loves to learn, to socialize, and to have something that’s his own. You will quickly see that he has a huge heart. He is a natural leader. And he is very empathetic, always looking out for others and willing to include everyone. But today, I noticed another side of Miles…fear/nervousness/apprehension about going to school, starting something new and unknown. He’s always been my go-getter, strong-willed and stubborn, yet sensitive and loving. As he’s gotten older and begun to understand more, I am noticing him picking up on EVERYTHING and taking on roles no four year old should have to take on. I cringe at the thought of all the doctors visits he’s been dragged to – from neurologists to homeopaths – and the therapies has to wait patiently outside of for hours at a time, but that goes with the territory of having a special needs sibling. While it hurts my heart to write this, Miles looks to school to fill a void of friendship, attention, and play that he is not getting at home. As much as I would LOVE to see my two sons running, playing and laughing together, that’s not the reality of life at home. As hard as it seems day to day, I know these experiences are shaping Miles to be a special soul himself. He intrinsically knows why Chase won’t play with him, why he can’t talk, and why their relationship is “different.” But I know it still hurts him deep down. Miles is Chase’s biggest fan. From the time he was born he has looked up to Chase and wanted nothing more than to have his attention. Because of the Autism, Miles doesn’t get it very often. But he never gives up trying. He is protective of Chase, always looking out for him, making sure he’s OK, and “showing him off” to all his friends. The pride he exudes when Chase does something new or great warms and breaks my heart at the same time. Miles knows pain, he knows stress, he knows worry, he knows heartache, and victory, but most importantly he knows unconditional love. So while it’s not “ideal” for him to live with certain stresses at home, I know without a doubt it will make him a better person in the end. I do my best to nurture his spirit, encourage and build his confidence, reassure him and praise him for the wonderful person that he is, but at the end of the day I am just doing the best I can with two children who have extremely different wants and needs. I pray constantly for guidance and patience. I know God has special plans for his special little soul. I don’t have specific instructions or advice to go with Miles, I write this simply so you will know where he comes from, why he is the way he is, and help him to grow in confidence this school year. Thank you for investing in our children. Nurturing their curious minds and spirits. And helping to shape them to be better kids with each day!